Ferrata is from 15.6.2018 opened again! We warmly welcome you, invite you to discover „pure wilderness“ and wish you unforgettable experiences. Tourist season 2018 starts with a new – regional discount for ferrata visitors. Basic entry fee for single pass is 5 €. Entrance after applying regional discount is 2,50€. inhabitants of the region with permanent residence in Spišská Nová Ves a Dobšiná and in villages Smižany, Spišské Tomášovce, Letanovce, Hrabušice, Betlanovce, Spišský Štiavnik, Hranovnica, Spišské Bystré, Vydrník, Arnutovce, Mlynky, Dedinky, Stratená, Vernár, Telgárt, Hnilec, Hnilčík. Ferrata set and equipment is mandatory for each visitor. Visitors can hike the ferrata trail individually or with a guide providing professional interpretation after agreement with the Authority of Slovak Paradise National Park. Guided hike is not mandatory. 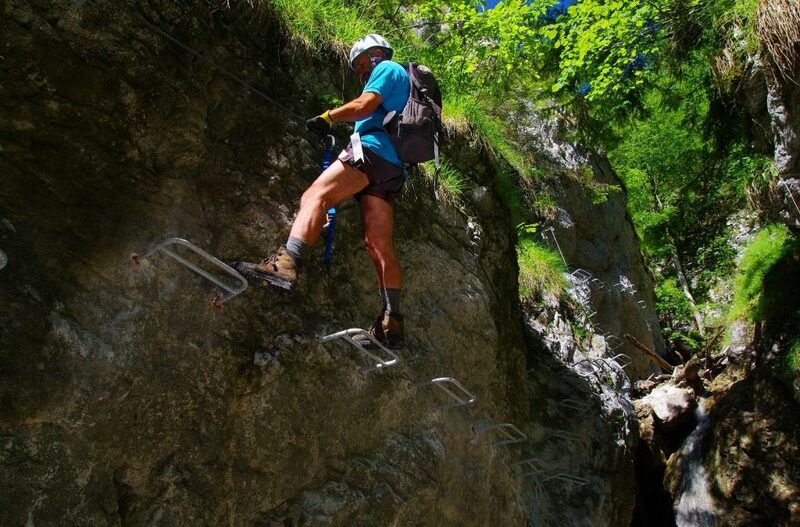 Kyseľ ferrata trail is accessible from the 15st of June to 31st of October. Kyseľ ferrata trail is a one way route. Visitors can pass it in one direction only – from its bottom to its top! Find more details about the route, ferrata equipment, interesting facts and operating instructions in the following pictures. Kyseľ ferrata trail is charged. Single ticket for one tour is 5€. Revenues from the ticket sale are used for nature conservancy purposes solely. Each visitor shall receive with the ticket detailed booklet, which describes ferrata sites, natural values of the ravine and many more interesting facts about the Kyseľ gorge. Booklet is available in Slovak and English version too. Renting of the ferrata sets only with guide of Authority of NP Slovenský raj! : in TIC it is possible to buy only tickets, without possibility to rent a ferrata set! In the store SPORTRYSY Poprad- OC Storeland (near OBI) you have the possibility to buy the ticket to ferrata trail and rent proffessional ferrata set. Used ticket can be changed for discount in a value of the ticket when buying over 50 euros in our store. You can order tour guide service with a proffessional interpretation about nature, history, and interesting facts about the Kyseľ gorge, upon an agreement with Authority of NP Slovak Paradise, who is providing the guidance. Guided tour starts at the spot Kyseľ, ústie. Price for a guided hike is unified- 50 € per group. Number of participants in one group is maximum 10 people. Entry ticket to the ferrata is not included in the guiding tour price. Basic entry fee for single pass is 5 € per person. The rental of the ferrata set is charged separately – 5 € / set / person. You can book guided tour by filling the preliminary form (see below). Maximum number of participants, which we are able to guide is 18 per day. 9 people with one guide! Maximum number of ferrata sets, which we are able to rent is 18. You can check the occupancy of the days in the year by the number of participants interested in guided tour in Calendar of registered people for guided tour in Kyseľ ferrata. Person interested in the guided tour send filled form. After correct completion and despatch of the form, the registration will be confirmed in the dialog box of the form. Please, complete the registration for guided tour at least two days before required day of the guided hike. Therefore, system can register your application and we are able to ensure a guide for your tour. Employee of the Authority of Slovak Paradise National Park will contact you at least 24 hours before to arrange the details. If necessary, please call Mucha Vladimír +903 298 220, during the working days also Authority of the Slovak Paradise National Park +53 44 220 10. Authority of the Slovak Paradise National Park can for capacity reasons refuse the guiding. In this case you will be informed in sufficient time. 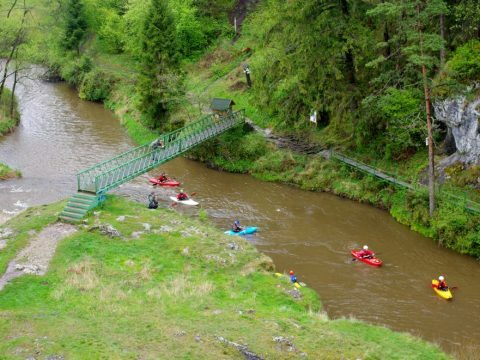 As a part of a new hiking trail Kyseľ is a freely accessible part from the bridge over Obrovský vodopád (Huge waterfall) until Kyseľ rázcestie ( confluence od Malý Kyseľ and Veľký Kyseľ). At the lower part – up to tourist direction sign „v Kyseli“ – it is reconstructed, bidirectional trail with iron steps and grips. In the upper part – above the tourist direction sign „v Kyseli“ up to „Kyseľ rázcestie“ ( confluence od Malý Kyseľ and Veľký Kyseľ) – it is a one way trail leading to Karolínyho waterfall using less demanding ferrata elements and accessible also without ferrata set and ticket. You can visit freely accessible part of the trail without ferrata set and ticket as follow: from Kláštorisko to tourist direction sign „v Kyseli“, where you turn to Obrovský vodopád. You will approach the bridge over Obrovský vodopád, from where you have to go back to „v Kyseli“. From this spot you have to go up to the Karolínyho vodopád using ferrata elements until the Kyseľ rázcestie ( confluence od Malý Kyseľ and Veľký Kyseľ). Insurance for intervention of Mountain Rescue Services is not included in the price. Ferrata trail visitors have a possibility to buy an insurance separately for 1€ /person/day at the ticket sale points. Those entering the gorge without a valid ticket, and those entering the gorge in the period other than allowed or in case of failure to comply with the conditions listed in the operating instructions shall be imposed a fine up to 66 euros by employees of the Authority of Slovak Paradise National Park or nature guards. Please, respect the signs in terrain! We hope, discovering of the „true wilderness“ will bring you unforgettable experiences. Please, be respectful to the nature and other visitors.